State-of-the-art sensors that can measure stress levels, mood, posture, performance and even smell took centre stage at Asia's top high-tech fair in Tokyo. The big-screen TVs and entertainment systems that were all the rage 10 years ago at the CEATEC fair have gradually been replaced by tiny sensors that accurately measure the minutest facet of the human body—a Japanese speciality. 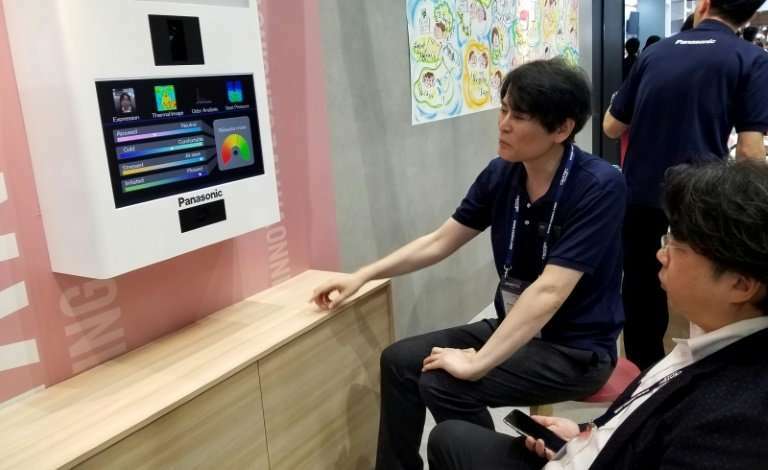 Electronics giant Panasonic showcased a prototype of an armchair that measures how much the user's hands sweat along with the seating position and facial expressions via a camera, all to determine stress levels. This could be useful for an airline pilot or long-distance truck driver for example but could also one day find its way into the workplace. "You could imagine such a chair in the office and by combining the results with air conditioning and lighting levels, you could adjust the ambiance of the office to enable people to relax if necessary," a Panasonic demonstrator said. Components manufacturer Murata Manufacturing has pioneered a small device that is held for a minute between the thumb and forefinger to measure pulse rates and the nervous system. "We are going to start selling this very soon to companies, so they can measure how stressed their employees are. Transport and taxi companies are especially interested," said Takashi Hayashida, a spokesman for the firm. Staff equipped with sensors could be under permanent surveillance to "improve their posture and productivity," according to Japanese electronics firm TDK. This also extends to the field of play, with Fujitsu demonstrating a 3D analytical system based on sensors to improve the performance of gymnasts. Sensors are also being put to work to improve healthcare—especially for the elderly, with nearly 28 percent of the Japanese population over 65. 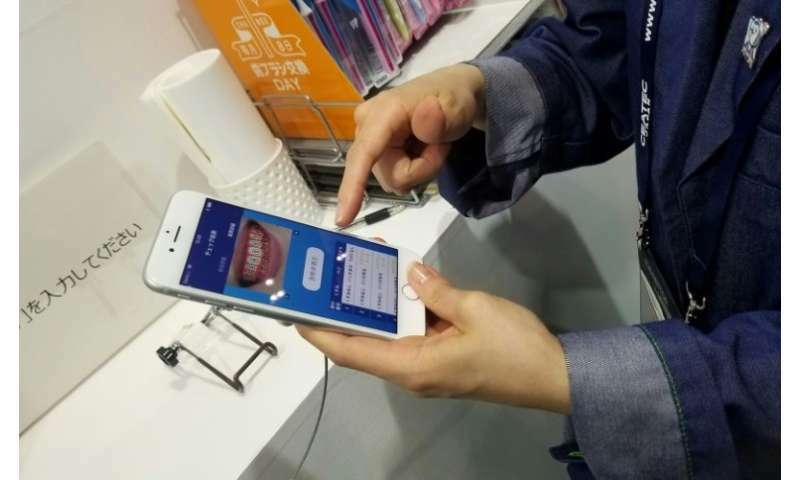 Using a device created by hygiene firm Lion, patients worried about their teeth can flash a smile at a smartphone and send it to a specialised server that returns data on oral hygiene. Housing equipment firm Lixil has developed a sensor for the bathtub that measures water temperature and key vital signs like pulse and body temperature in an attempt to reduce sudden bath deaths, which afflict more than 5,000 people annually in the country, 90 percent of them over 65. At the other end of the age scale, sensors are being deployed in a bid to ease labour shortages in kindergartens and creches. Japan's public New Energy and Industrial Technology Development Organization has developed a super-fine and sensitive film that can perform a host of functions related to childcare. For example, placed in a cot, it can upload data to a computer showing whether a baby rolls onto its stomach or its temperature spikes—alerting an adult if necessary. "There is a staff shortage in creches. We need solutions to ease their task and enable them to watch over more children at a time," said a demonstrator. The same film can be used to determine how much and at what speed a meal is eaten—in a hospital or retirement home for example—by measuring the pressure applied on a table by a bowl or plate. Of course, much effort is also devoted to matters that are less life and death, especially body odour, to which the Japanese are especially sensitive. Cosmetics giant Shiseido recently commissioned a study to demonstrate that the odour given off by a person under stress smells like... onions. And the sensors are not just for humans. 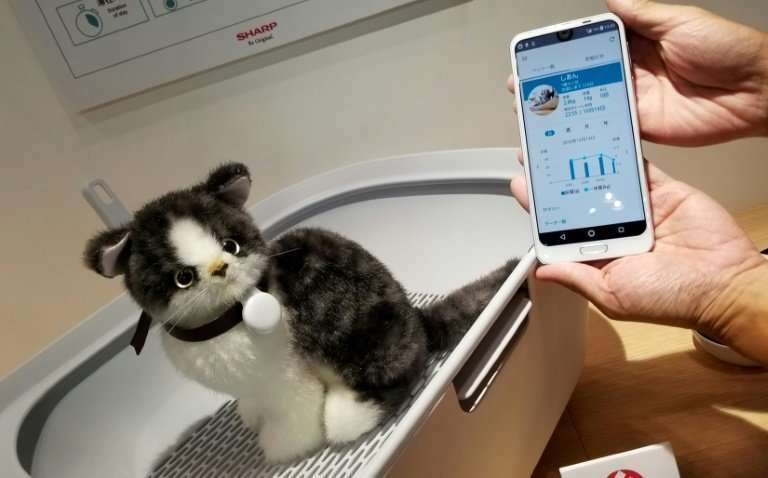 Sharp has developed a cat litter tray equipped with monitors to measure kitty's urine volume and frequency.